Zack befriended some old toys today. He got these trucks for Christmas (or maybe even before that) and has never showed any interest in them. 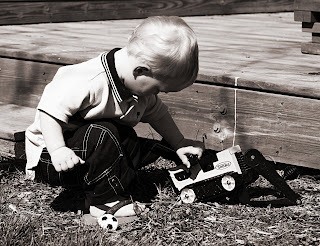 Lately he has started playing with trucks though, which he never showed any interest in before. He was strictly a ball boy. I've had these sitting on the top shelf of his tall bookcase and he asked me to get them down this morning. He played with them all day today. He also watched full episodes of The Wiggles and Mickey Mouse Clubhouse today. TV has never been able to hold his interest for more than a couple minutes. I must admit it was a nice break for mommy, but if it continues I'll have to pull the plug. I can't believe he is almost two! 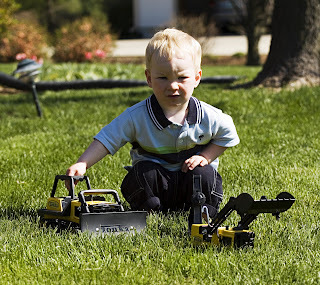 He's such a little boy playing with his Tonka trucks...too cute!! !